It can use for any 12V, 24V, 36V and 48V battery bank. New and old batteries. Why using the battery desulfator? Batteries often fail because “sulphates” slowly develop and cover the battery plates. This sulphating process also weakens the electrolyte and this combined with the gradual coating of the plates slowly and almost imperceptibly reduces the battery’s ability to receive, store and then deliver power. This sulphating process gradually impairs battery function and causes a capacity loss until the battery can no longer perform the desired task and so the battery is deemed to have “failed”. However using a Battery Desulphator can reverse the process by dissolving the sulphates, cleaning the plates and restoring the electrolyte strength therefore improving a battery’s life and capacity for an extended period. 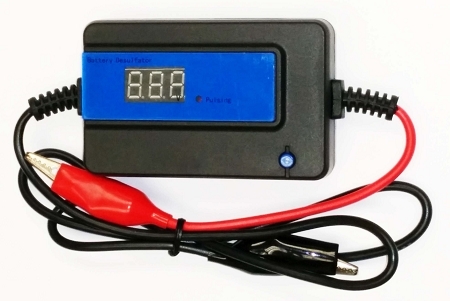 The Auto Pulse Battery Desulphator/Rejuvenator/Recovery unit uses no external power and generates a high-frequency pulse to dissolve a battery’s “sulphates”. The High-frequency Peak Pulse delivers an electronically controlled pulse to the battery causing crystalline sulphates to dissolve back into the electrolyte. This helps restore battery function and electrolyte strength and will regain the batteries ability to receive charging current and deliver discharge current. Many desulphator products use an old technology inductor design to generate the pulse to desulphate a battery. This old technology creates a harsh inductor peak that can be damaging to the battery plates. Utilising our new capacity pulsing method, a “soft” peak is generated so sulphates will dissolve without damaging the battery plates. Old technology also requires a large inductor so it necessitates a physically large desulphator device whereas using our advanced technologic design, the Auto Pulse Desulphator device is very compact yet provides BIG performance. Connect the red connector to the positive battery terminal and the black connector to the negative battery terminal. It does not revive physically damaged batteries or batteries with dead cells. It is recommended you do not remove the device from the battery. Keeping the pulse on the battery permanently will prevent sulphate from developing inside the battery. The longer the device is connected to the battery, the greater the improvement. A battery permanently charged and treated with the device will be at the top of its capacity for years. If the device is removed, sulphates will again begin to accumulate and reduce battery capacity.